I need your help. I bought a sweet potato to force myself to cook it in a way that was exciting to me. I’m not a sweet potato fan unless they’re fried. Too mushy, too sweet. And yet, because I’ve come to appreciate how intensely nutritious they are, thanks Dr. Health Is On Your Plate, I wanted to cook it and like it, but …. It sat in the fridge for weeks. Until this morning. I was working on the new book, on Pâtés Confits and Rillettes, on some confit recipes. My partner in Charcuterie, Chef Brian, sent me a recipes for tasty morsels cooked slowly in fat, one of them a butternut squash. Of course! This would work beautifully with that neglected sweet potato I have to keep looking at every time I open the fridge. And a new dish was born (at least to me). 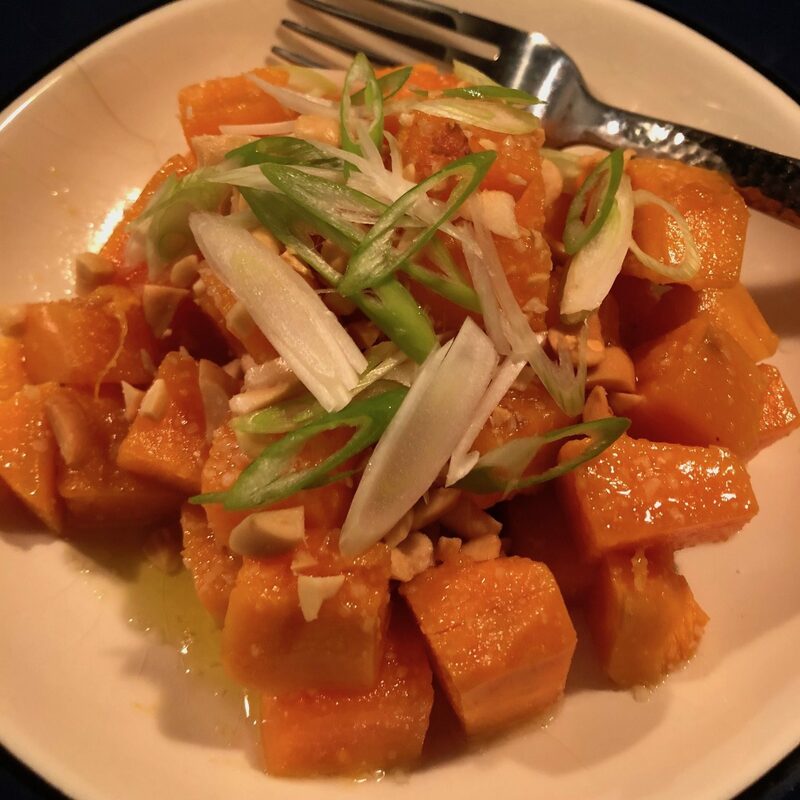 Sweet potato confit, poached in olive oil, seasoned with lime and heat, garnished with chopped peanuts and scallions. A fabulous dish. It could be a main course for those of the vegetarian persuasion (that and a salad will be a deeply satisfying dinner) or a great side dish for roast chicken or roast pork. I’ll continue to work on it, but for now the recipe below outlines the basics. Put the sweet potato in an appropriate pan (the smaller the base the less oil you’ll need) and cover it with olive oil. Add the garlic, chili peppers, and bay leaf, and put it over low heat (use a heat diffuser if you have one—try not to let it simmer, 180˚F. is optimal). Cook until tender, about 40 to 60 minutes. Serve immediately or cool and refrigerate. To serve bring the pot back up to heat (180˚F. ish). Using a perforated spoon, preferably a Badass Spoon, split the potato between two plates or bowls. Sprinkle generously with kosher salt. Squeeze some lime over each. Sprinkle them with Espelette powder. Sprinkle them both with the peanuts, and top with scallions. This will serve two, but feel free to double or quadruple; leftovers will keep submerged in olive oil for weeks, ready for a last minute reheat. Save the seasoned oil for more cooking or seasoning. Michael is on Twitter! Join in on his comments there. Try Japanese sweet potatoes and cook them like hash browns (lower heat than white potatoes though, they burn quickly), they get crispy easily and taste delicious. Don’t bake or microwave them, they’re almost inedible that way! Mentioned this in your Twitter. But we like to make sweet potato hash with kimchi and bacon. Topped with a poached or fried egg, scallions, black sesame seeds. Microwave sweet potato until tender, about 7 minutes. Let cool & remove skin. Mash, then mix in eggs, cinnamon, nutmeg, & salt until smooth. Melt oil in a pan over medium heat. Add ¼ cup batter & cook like pancakes. Not my recipe, I wish I could remember where I got it so as to give credit. Puréed, with a cream/milk combo that has been simmered for at least a half hour with several cloves of garlic. Finish with butter and a teaspoon or more (depending on taste) of sambal oelek, or sriracha if you don’t have sambal. Salt and pepper to taste. The spice builds up as you eat- yum!. Nice alternative to supersweet purees. This is an old Ming Tsai recipe but I can’t find it online anymore. I love sweets, especiallly garnets. My favorite is roasted, souffle and used to substitute in squash recipes, such as Pumpkin or Butternut squash pie. Hope this helps. Not real original but you ask for suggestions. Since you say you don’t like mushy how about making chips with them with some sea salt. maybe some thyme also. So glad to have you back! If you haven’t been to naturallyella.com, you are missing out on literally hundreds of fantastic sweet potato recipes. (I am not her, or her publicist, or her relative – just a fan of good food). Sweet potatoes are kind of her thing. I like them boiled and mashed with salt, pepper, butter and heavy cream. I”m not sure if your dish above uses real sweet potatoes or yams; but I prefer the former. First of all, please take your sweet potatoes out of the frig (?!) and put them in a cool, dry place (a cupboard). I like to roast a couple of potatoes whole until soft. Peel them and put them in a mixing bowl with about 2-1/2 tablespoons butter, about 1/4 cup cream or milk/cream combination, 1/2 tablespoon brandy, and salt to taste. Mash everything together (or puree with an electric mixer (but not a food processor). Spoon the mixture into a buttered dish and bake in 350F oven until golden and a little bubbly. Serves 2 – 4 as side dish. I’ve also made the same basic baked puree with some Thai red curry paste and coconut milk, instead of cream and brandy. What about an African peanut stew? Those usually have sweet potatoes. And the sweetness is combatted by peanuts. I take a cue from Heidi Swanson and make a dressing of miso and Thai red curry paste mixed with enough olive oil to make it thin enough to coat. I’ve been using this on all kinds of autumn vegetables. Roast ’em till they get some good browning. Your confit reminds me of the best potato I ever had, at Alinea of all places. Poached for 24 hours in olive oil then buried in salt and set aflame. I’m sure the truffles and creams that went with didn’t hurt! Two things I like to do with sweet potatoes. First I cook them like a baked potato, normally in the microwave. I just season them and add a drizzle of lemon infused olive oil. The lemony olive oil breaks the sweetness of the potato. The other thing is I like to par cook them in the microwave, cut them in wedges, and then either throw them on the grill or into the pan when I grill or pan roast. My favourite sweet potato recipe is a stew with cabbage, tomatoes, okra, and hot peppers. I think the original recipe was from Moosewood Restaurant Cooks at Home. Hi there! Nice to see you back. One of my favorite ways to use a sweet potato is to dice it up and include it in chicken mulligatawny soup. In place of or in addition to diced apple, it adds a nice hit of sweet and also breaks down to thicken the soup. Whatever soup recipe you use, if it calls for cream to finish it I suggest substituting in coconut milk. Okay, sweet potato confit is easily one of the best sides EVER! Sweet potato dish sound good, but I cringe at storing sweet potatoes in the fridge. I like roastingthem with ground chipotle and some thyme but the flavors would work with mashed or puréed too. When I’m cooking for a wimp I’ll sub smoked paprika for the chipotle. They’re a great addition to tortilla soup – basically just chicken soup with some chile paste. I’ll usually throw some beans and whatever other vegetables are laying around. We rough chop sweet potatoes and cook them with brown rice in chicken stock. Then we use that as a base for homemade dog food. Our pups love it! Hey..pups have to eat too! This sounds yummy – I’ll have to try it. I like to roast cubed sweet potato with warm spices – cumin, cayenne etc. I’m not a fan of pairing it with cinnamon and sugar because I think it’s sweet enough. However, I love candied sweet potatoes at Thanksgiving but not with marshmallows. That’s a deal breaker. We use just brown sugar, butter and a bit if water and candy them in a skillet. Yummy! Could this preparation be done in a sous vide bath at 180? I’m gonna be “that guy” (gal) and wonder if there’s a way to oil poach in an InstantPot. I’m not trying to be trendy, I’m just always looking for a way to cut down time and mess in the kitchen. In any case, thank you for a recipe that might make me actually like eating sweet potatoes! I love left over thanksgiving turkey, I make a version of bobby flays sweet potato chipotle chicken hash with poached egg & green chile holandaise sauce. The heat & smoke from the chipotle’s work great with sweet potatoes. I think yams are sweeter and pair better with this one. Heard you will be at the Miami Book Fair next month. I was glad to see a name I recognized! Hope to see you there. This is also a confit, but it’s crisped in a pan, which adds nice texture. I think the savoriness of the sausage works well with the sweet potato. Michael — My favourite way is actually diced, drizzled with evoo, salt, pepper, and tons of fresh thyme. Throw ’em in the oven at 450 until a little charred around the edges. If you’re feeling frisky, mix potatoes, yams, and sweet potatoes together and do the same thing. A lovely trio. Diced, roasted with diced onions, chick peas, salt, turmeric, cumin and a little chicken fat, squeeze of lime. Great alone or in a salad. I like to roast my sweet potatoes after mixing in olive oil, salt, pepper, smoked paprika, cumin and coriander. Then toss with cilantro and lime. Great with some grilled chicken. Bake them in the skin. They peel easily once baked. Eat with butter, salt and pepper. On the other hand, the garnishes of your recipe would be super. Baked sweet potatoes are super easy to make. Baking them would give your dish less delicious unctuousness, but less fat too. I find the soft and wet texture of baked sweet potatoes very satisfying, without a great deal of fat. I’d just recommend you fry the meatballs first, and then only add enough stock later on to keep things from sticking. Thanks for all these great ideas everyone! Sweet potatoes go wonderfully with rosemary and ham/bacon. Sautee in cast iron skillet and then finish in the oven under the heating element to get the perfect amount of crispiness. Or, adapting a butternut squash slow cooker recipe, dice potatoes and place in slow cooker with soy sauce, onions, garlic, ginger, maple syrup, and a touch of brown sugar.